Welcome to All Custom Iron LLC where we create handmade iron products. Our specialties include iron security doors and gates, as well as ornamental iron fencing and entryways. We are a family run business, and we can create anything out of iron! We have over 25 years experience working with Iron. All of the iron products are handmade by the owners; and we take great pride in our work. We fully weld all of our products, and we do not cut corners and use plastic caps. With the iron fully welded it helps to extend the lifetime of the product. 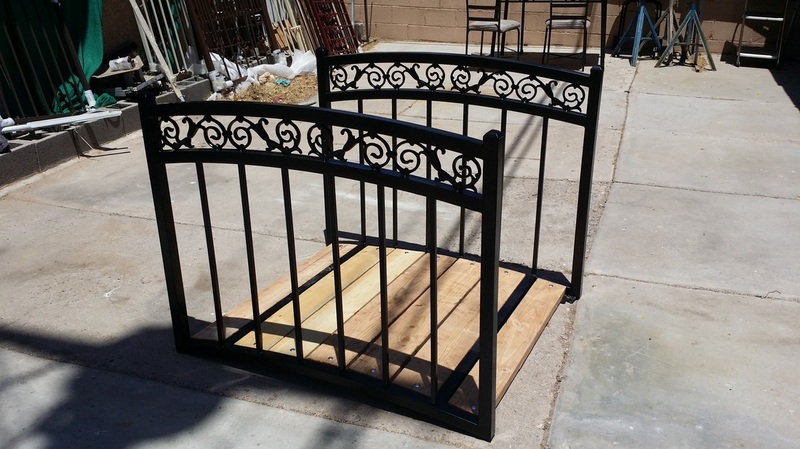 Not only do we fully weld all of our products we also powder coat all our iron products, we take these extra steps to provide the best iron products in the Las Vegas valley and surrounding areas. We are here to provide an excellent quality job for our customers. We work very hard to provide the best product in our field. So if you’re looking for excellent service and an excellent product please give us a call and we would be happy to help you. Call John at 702-850-4082 to schedule your free quote!! All Custom Iron Security Doors Iron Security Doors Las Vegas With the recent increase in break-ins we have been getting the question, what can I do to make my home a safer place for my family? Well an iron security door will do the trick. An Iron Security Door can significantly help stop a would be burglar from breaking in to your home. Remember the more difficult you make it for someone to break in the quicker they will move on to the next house. We custom build our Iron Security Doors by hand, we will custom build your security door to your specifications, we also install all of our iron products ourselves so that you can be sure that you and your family are safe! All Custom Iron Entry ways We pride ourselves on our excellent customer service and we will only put out the very best product. We would love to create an All Custom Iron Entryway to help keep your home secure. We can make you an All Custom Iron Entryway to fit your needs and help protect your house so please give us a call so we can to help you in securing your home. All Custom Iron Double Gates We take great pride in our Double Iron Gates. Double Iron Gates are a show pieces for your yard and house! They can be seen from far away and can make your yard and your house look beautiful. 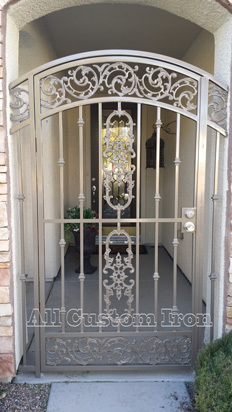 So at All Custom Iron we take great pride in making you a one of a kind Double Iron Gate. With 25 years of experience we can make you almost anything that you could ever want and it will be a beautiful addition to your house. All Custom Iron Single Gates Iron Gates Las Vegas NV We make our All Custom Iron Gates in our show by hand, all of our iron gates are individually made to fit each customer’s wants and needs. When placing your order we will come to you and make sure that everything is to your liking before we start the job. We install all of our work ourselves to be sure that it is done correctly; we do not use any middle men. We take pride in giving you the best product for the best price. If you have any questions about our iron gates or any of our other products please give us a call. All Custom Iron FencingWe really love to make Iron Fencing. Iron Fencing is where you can see our attention to detail. We fully weld all of the pickets and we take the time to get the spacing right, we do not take any short cuts. We also primer all of the Iron Fencing prior to painting, having 25 years experience in this field and having one of our owners personally make all of our custom iron products really sets us apart from the rest. These are just a couple of the many ways that we ensure customer satisfaction. Thank you for looking at All Custom Iron Patio Covers. We like to pride ourselves on being the industry leader and to set the standards of excellence, and top quality craftsmanship. We come to your house to sit down with you, the home owner and draw up our exact plans for your patio with you, to make your back yard dreams come true. With are helpful staff we can help you walk through all the steps of layout, pulling permits and installation. What we like to do is add a little wrought iron design in to the patio cover, so you can get a one of a kind design of all your own. All you have to do is give us a call and set up your FREE ESTIMATE! All Custom Iron Security Windows Iron security windows Las Vegas, NV One of the many products that we make at All Custom Iron are iron security windows. We can make iron windows to fit any shape and size window you have at you house. You can pick any one of our designs throughout our entire website and we can make it in to a security window. So with the endless designs that we can make were sure you will find one that will fit your houses style. We take pride in our iron security windows! There are a few questions all people should ask or being informed of before they decide to go with any iron company. #1 Does the iron company that you are purchasing the ornamental iron from provide powder coating? If it is powder coated do you have to pay any extra for the powder coat? If they do or do not, powder coat you should ask them if they know the difference between the two and see which one is better for you. #2 Does the iron company you are purchasing the wrought iron from fully weld? Asked them if they fully weld if they do or do not, definitely ask them which one is better and why. #3 Does the iron company cut their corners at a 45° angle and fully Mitre them, or if they cap corners with plastic caps on their iron security door, Single and Double iron gates? #4 Does the price of the iron include installation, or is installation going to be additional? Some iron companies do not charge additional for installation. #5 If you are purchasing a iron security door. You should definitely ask if they will provide lock and knobs if they do what price are they. Some companies provide free lock and knobs with the purchase of iron security doors. Las Vegas, NV (KTNV) -- A northwest Las Vegas neighborhood is on edge after a series of home and car burglaries were caught on camera. The crimes happened within the past week near the intersection of North Tenaya Way and Washington Avenue, just days after Action News reported on a second string of burglaries in nearby Summerlin. Now residents aren't just angry they're being victimized; some are afraid to go to sleep at night. One crook captured on camera is seen walking up to a car and checking and the door handle to see if it's unlocked, at one point staring directly into the camera. Homeowner Gary Alu said he only thought to check his footage when a neighbor told him they'd seen some suspicious characters walking the street around 3 a.m., checking other cars. "It's just a shame that we can't live in our home. We have to do things like this, security bars and security screens and alarm systems. Neighbors are on edge, it's a problem," Alu said. His home was burglarized last spring as well. The Las Vegas Metro Police Crime Map shows that since June 1, there have been 26 home and car burglaries within a mile of Alu's house. If you expand the search to two miles and search for the same type of crime within that time period, the results yield 133 crimes. Just a few doors down from Alu, another woman who preferred not to identify herself also caught a crook on video. In broad daylight a man is shown breaking in through a kitchen window before he spends 45 minutes inside, eating food and loading electronics, jewelry, and heirlooms into garbage bags. The man then sets the bags on the sidewalk before he loads up his car and drives away. "I'm guessing it was about $70,000 in items," the woman said. These neighbors want a bigger response from police and for these criminals to know they're watching. Police say crimes of opportunity do increase in the summer months and it's especially important to remember to lock your doors and never leave valuables in sight.